I went to my regular Friday morning Weight Watchers meeting and did my June weigh in ... was pleased to be at my happy weight... now if I could just put some nice muscle in my arms and shoulders I would be really happy. I wonder.... if that's true. We went for a very brisk afternoon walk to town and back, about an hour long, and I did a stretch afterwards. 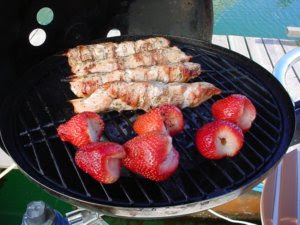 We picked up some pork souvlaki skewers to cook on the grill with some huge strawberries. So good. I am going to map out an 8 km route for our Saturday morning run. I've never thought to grill strawberries, yum! so interesting..never had strawberries on the grill!! !